I promised to take a quick look at one of my mum’s friends laptops the other evening, the brief was; they had a problem opening office attachments, and their wireless mouse was’nt working. I assumed they needed the document conversion pack and probably had a flat battery, so I downloaded the update, and slung some batteries in my laptop bag. The attachment problem was sorted (by re-installing office and changing some file assocations). But the mouse (Which was bluetooth) was somewhat more “fun” to fix. Basically the laptop had been rebuilt some time ago, and since then the bluetooth would not work, normally I’d just download the drivers but that would have been too simple. 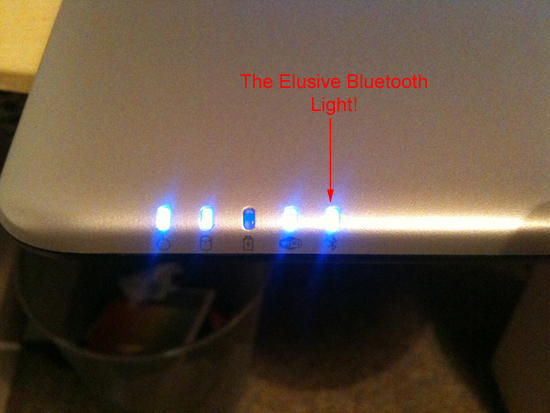 Before I could get the mouse to work I needed to enable bluetooth on the laptop. 1. Stop searchig the chassis there is no switch to enable blueetooth, it can only be enabled by software. 2. Download Bluetooth Driver software here. 4. It will dump all its files in C:delldriversR140135, once the files have extracted navigate to the C:delldriversR1401353100_216 folder and run setup.exe. 5. At the end it will tell you to enable wireless by pressing fn&F2 – THIS WONT WORK, click cancel. 6. Back in the C:delldriversR1401353100_216 folder you need to open the Win32 folder if your on a 32 bit machine or the Win64 folder if you on a 64 bit machine. (I dont know). 7. Locate the Inst.exe file and run it. 8. At the end it will once again ask you to press Fn and F2 – Do nothing, but leave the install sat there waiting. 10. Double click BTTray.exe and after a few seconds the bluetooth icon should appear in the taskbar (bottom right). Right click it and turn it on. 11. At this point, the install will burst back into life and setup your bluetooth wireless.